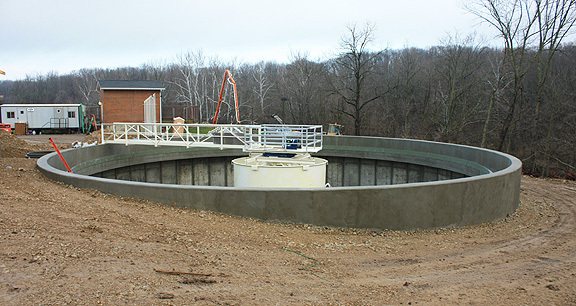 Project obstacles and solutions: The City of Greensburg, Indiana made plans to replace an aging surface water intake for their fresh water treatment plant along the Flatrock River. The new surface water intake included a low-lift pumping station, intake storage tank, a new clarifier and a treatment facility and pump house. Mitchell and Stark were selected as the general contractor for this project. Key to any water treatment project is protecting the water from contamination. Nothing is more critical to this than the concrete used in a water treatment facility. If water seeps through the concrete from the outside, the water inside the tank will be contaminated. There are two aspects to making sure there is no ingress of ground water through the concrete. First, sealing up the pores and capillaries in the concrete is necessary to make it waterproof. In this case, IMI used a crystalline waterproofing admixture in the walls of the holding tank and the clarifier. The crystalline admixture rides with the bleed water as it escapes the slab in its plastic state. It then hardens in the pores and capillary trails left behind by the bleed water. The second aspect of protecting the water from outside contamination is controlling cracks. IMI used a high range water reducer and a shrinkage-reducing admixture in the concrete. By lowering the water-to-cement ratio and keeping the water tension on the surface of the concrete in check, plastic shrinkage of the drying concrete is minimized. This greatly reduces the possibility of drying cracks. IMI supplied 2,500 yards of 4,500 psi, air-entrained concrete for this project.The new Flatrock River Water Intake Facility is on schedule to open in the summer of 2016. For more information on waterproofing concrete or controlling cracks, contact the sales representative for the plant nearest your location. Click here.